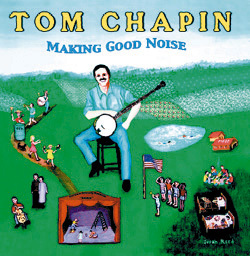 Tom Chapin "Making Good Noise"
Gadfly Records is proud to announce the release of a brand new family CD, MAKING GOOD NOISE, from two-time Grammy Award winner Tom Chapin. The new album is the tenth installment in Chapinâs remarkable series of albums for families to enjoy together. Chapinâs nine previous family-oriented recordings have won every award in the book: Parentsâ Choice Gold & Silver, the American Library Association, Parents Magazine and the New York Music Awards, as well as multiple Grammy nominations. On MAKING GOOD NOISE, Tom Chapin continues to speak to children and families with great wit and wisdom. A storied live performer and a pioneer in the field of childrenâs music, Chapin and his collaborators (John Forster, Michael Mark and Jon Cobert) have crafted an ever-expanding body of original music aimed at the post-toddler, pre-teen set. The songs are full of ideas yet, while many impart a message, the overall tone remains light and fun. Teachers throughout North America have incorporated Tomâs songs into their curriculum, finding them accessible and adaptable to classroom study and interaction. What makes Tom Chapinâs music unique is its across-the-board appeal - kids find it funny and contagious, while adults find it intelligent and creative. It becomes a place where kids and parents can meet and have fun, music they can listen to together. It makes you feel good about yourself, emphasizing a positive awareness of life, family and our environment. And hey, itâs really fun! MAKING GOOD NOISE is full of lively tunes and fresh, witty lyrics and, as always with Chapin, the music is top notch, covering an extraordinary range of styles and ideas. With terrific songs, great singing, a hot live band with real horns, and even a famous string quartet, this is not your typical kidâs record! This time the theme is making music: a Tomâs-eye view of the joy and craziness of learning, playing, sharing, creating, practicing and performing together. These fifteen new songs plunge us into his musically delightful, inventive, story-filled world. "I love this record," Tom says, "and hope it will be played a lot, especially on long car trips when parents and kids have to agree on music, and listen to it together." From snapping fingers and popping lips on the rockabilly tinged opening track, Making Good Noise, to the classical fun of imagining an orchestra on I Love To Play The Kazoo; from the kids staging "Annie" with a local musical theater group in Putting On A Show, to doing homework at midnight on This Song Is My Homework; from the joyfully rebellious march of Youâre Not The Boss Of My Brain to the family fun and chaos of Cookinâ In The Kitchen, this album is a total delight! Anyone who has ever been a summer camper or counselor will laugh along with A Day At Camp Decibel, in which the entire camp day is sung to famous bugle calls. There are two story songs about folk instruments: Tomâs haunting solo banjo frames My B-A-N-J-O, and is a total contrast to the riotous Soca beat of Bang On The Pan, which dances out the musical story of the steel drum: "an instrument we created out of scrap." Yo-Yoâs Ma is a hilarious musical story about the famous cellistâs interaction with a yo-yo salesman, Duncan Duncan, sung at breakneck pace to a Groucho Marx-like polka, with pieces of a Dvorak cello concerto thrown in for good measure. The Hampton String Quartet introduces the idea of a solo, duo, trio and quartet, and then has this prestigious group perform This Pretty Planet (a longtime Chapin classic) in their fresh, classical rockânâroll style. Tom even unveils a funny new holiday song for these multicultural times as The All-Purpose Carol joins together Christmas, Chanukah and Kwanzaa traditions: "Itâs that falala, deidl dum, jambo jambo time of year." And as always with Tom Chapin, there are beautiful ballads. In Sing Me The Story Of Your Day, a parent sings, "When you face a fear, when you deserve a cheer, Iâve got two ears to lend you," and in I Need A Lullaby, a child asks for a song to say "goodnight is not goodbye." Tom tours year round. For further information about Tom Chapin or his schedule, please visit his website at www.tomchapin.com. To arrange an interview, please contact Claudia Libowitz at (914) 674-0247, (e-mail address: Chapinfo@aol.com). For additional information about the CD, contact Mitch Cantor at (802) 865-2406 (e-mail address: ).